The Bellingham Meadows are part of the Natural Valley Storage Project. The Army Corps of Engineers uses stategic areas of wetlands along the Charles River to slow the progress of flood waters headed to Boston. Sensibly, the Army Corp recognized the ability of wetlands to hold back flood waters and have preserved 7800 wetland acres along the river. Bellingham Meadows is Area S of the Natural Valley Storage Project. I paddled through Area G of the project in the Stop River Confluence trip on the river. 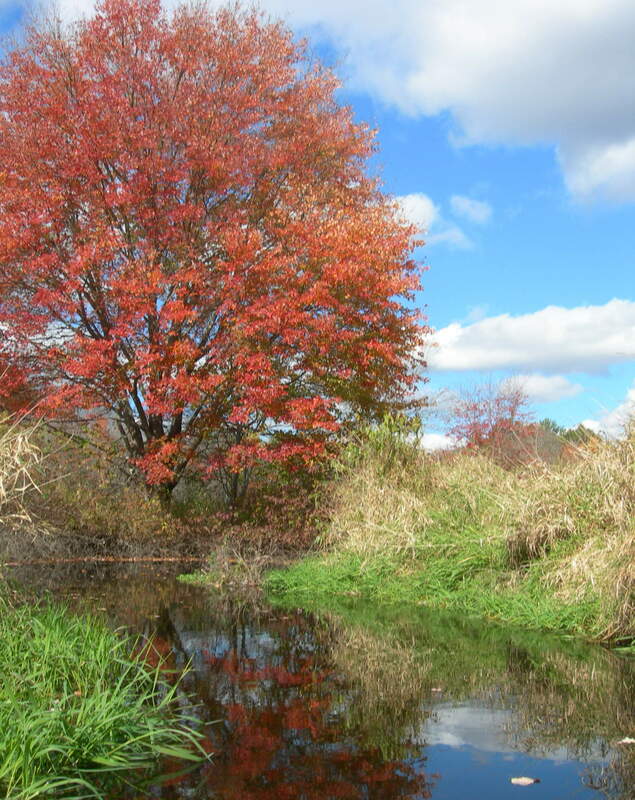 For those of you who have only seen the Charles River lying between Cambridge and Boston, you would not recognize the river in the Bellingham Meadows, closer to the headwaters. At times the river was as narrow as the length of paddle. In several places it was even narrower. It started off as as a very peaceful and pleasant. It was a bit colder than it was earlier in the week. I ran into the spookiest part of the entire river when I got to the Interstate 495 bridge. You can in the picture see that the bridge is very low over the water. At the water level that day, I just barely fit under the bridge. I paddled for a few hundred yards in pitch darkness as the roof of the tunnel got lower and lower. By then end of the tunnel I had to duck down in the kayak to fit through. It is not just the parallax effect in the picture, the opening at the far end of the tunnel is about two feet shorter than the opening at the entrance. The tunnel is intentionally low as part of the Natural Valley Storage Project flood control. The I-495 bridge acts as a culvert restricting the flow of the river. During times of high water, it acts as a dam limiting the flow of water downstream and backing the water into the Bellingham Meadows. Downstream from the I-495 bridge the Bellingham Meadows gradually give way to uplands. Throughout the Bellingham meadows the river zigs-zags back and forth with sharp S-turns. High Street in Bellingham is actually a causeway across the meadows with a narrow bridge allowing the river to pass through. Eventually the river reaches the North Bellingham Dam. That is where the day went downhill. 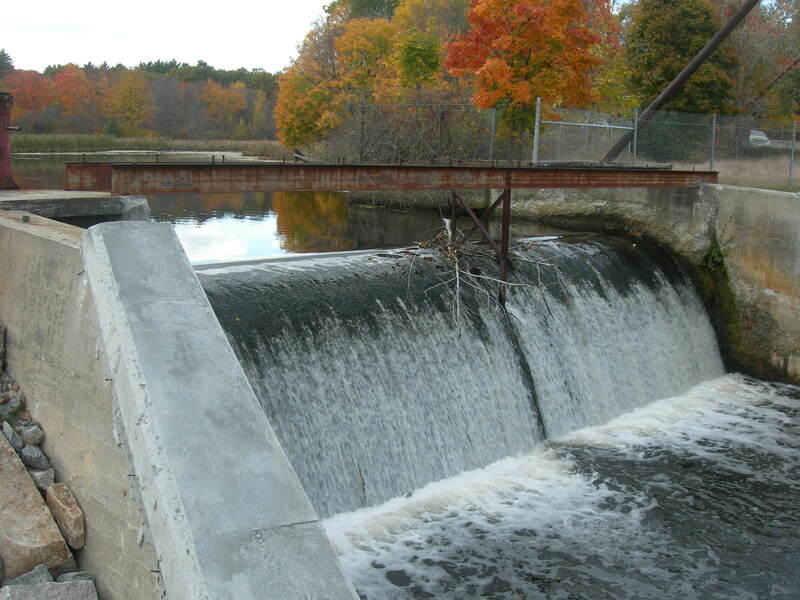 The North Bellingham Dam is a low structure that is crumbling and in disrepair. Downstream from the dam, the river is low, swift and rocky. There are also a few short ledge drop offs. After my swimming experience at the Cordingly Dam during my trip on the Hemlock Gorge section of the river, I was very tentative about paddling through rocky swiftwater. I portaged the kayak about 100 yards from the dam to Maple Street. There is a large industrial building on the far side of Maple Street. I walked along the parking lot scouting for a place to get back in the river. The rocky fast water continued for several hundred more yards. This was a bad omen. Then the foliage between the parking lot and the river grew impenetrable. this was a bad omen. The other side of the river was wooded put looked passable so I portaged the kayak for half a mile through the woods, vines and thorns along the river bank. It was nasty hike. I should have noticed the lack of portage route as a bad omen. I should have taken all of these omens to heart and not continued. I ignored the omens. I was halfway between my bike and the truck in an unfamiliar section of Massachusetts. I thought it would be better to continue downstream than to turn around and back upstream. The section of the river downstream from the North Bellingham Dam is a miserable stretch of the river. It is narrow and over grown. It is full of debris and fallen branches. It is rocky and shallow. It is barely passable. I spent as much time using my hands to push the kayak off obstacles as I did using the paddle. I needed a saw more than I needed a paddle. At one point there was picnic table blocking the river. The only redeeming thing was the sudden appearance and disappearance of an eight point buck along the river. I was happy to finally come to the small pond at the Caryville Dam. Even the takeout was miserable. The sides of the pond were overgrown and impenetrable. The only way out that I could find was a climb up a three foot high concrete wall next the dam. That means I had to pull myself and the kayak three feet straight up. Across the street from the dam is an abandoned factory. An ominous end to my week.